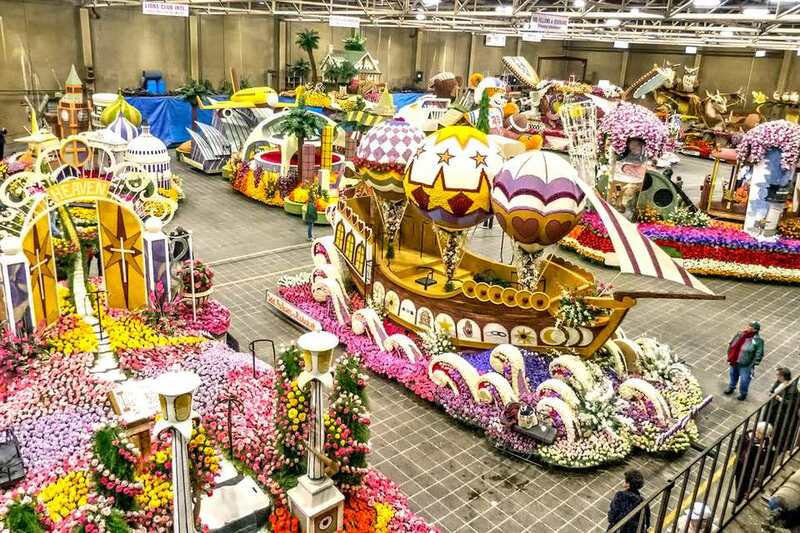 Over a few days just before the annual Pasadena Rose Parade, thousands of workers put those elaborate floral creations together by hand, gluing and sticking on whole flowers, petals, and all kinds of other natural materials. Some groups do their work in secret, but others let you inside to get a fascinating peek behind the scenes. It's a fun way to see the floats up close before they make their television debut, and a fun addition to that dream trip you made to see the parade in all its glory. In fact, if you want to see the Rose Parade but don't like crowds, seeing the floats being decorated is part of how you can see the Rose Bowl Parade the easy way. Float decorating (officially called Decorating Places) is open to the public for four days before the parade. Hours vary, but viewing ends by 1:00 p.m. the day before the parade and is by advance purchase only on that day. The viewing location for the float decorating is at the Rosemont Pavilion near Rose Bowl Stadium at 700 Seco Street, Pasadena. Another location is available, but it takes group tours only. Tickets cost less than an evening movie. You can buy tickets at any viewing location, but it's easier to order them online in advance. Children five years old and under get in free, but they may get bored and restless — and frustrated by not being allowed to touch things. If you park in the lots near the pavilion, the cost is not included in your ticket. To keep from spending too much time in line for a few minutes of viewing, arrive about 30 minutes before opening time. Lines to watch the float decorating get long — fast. At opening time, you might wait about 30 minutes, but get there later, and the wait may have grown to 90 minutes or more. Have the right expectations. Most of the floats you will see being made are done by smaller organizations, and you're not likely to see the big show-stoppers. On the day before the parade, the decorating will be done. You can see completed floats ready for the parade then, but go a day or two earlier if you want to watch the decorators hustle to get every last piece of fruit, seed, bark, grass, and flowers to their floats. Visitors enter the decorating area in small groups. You can stay as long as you like, but you'll likely be done in half an hour or less. You may see information from previous years about viewing the floats only from above, but that was at the Rosemont Pavilion which is no longer available for public viewing. At the Brookside Pavilion, you can walk at ground level, but you need to stay out of the way and will see the floats from behind barricades and scaffolds. You can drive to the location and traffic is manageable even on the day before the parade. There are plenty of parking lots near the pavilion, but street parking is harder to find, especially if you want to park nearby. Depending on the size of your group, a ridesharing service may be an easier and cheaper option. If you are going there from another part of town, you can take the Metro Rail to Pasadena and then take a bus to a stop near the pavilion. Use the Metro trip planner to figure out how. The Rose Parade would never be possible if it weren't for an army of volunteers who help put the floats together. They need lots of help: It can take 60 volunteers working 10 hours a day for 10 days to decorate just one float. If you are in town before the parade happens, you can volunteer to help. Some organizations accept walk-in helpers, but others make you register in advance. You'll have to meet minimum age requirements and sign a waiver. Float decorating is a messy job, so be prepared for that. Volunteer decorators are organized directly through the float builders. All the details are here.